Florida law protects people who are injured and hurt on property owned or operated by a hotel, motel, resort, spa, or casino (read more about the extent of Florida hotel premises liability law here) — except when it doesn’t. If you are a Florida resident who likes to gamble or a Florida tourist that likes the Hard Rock Cafe franchise, then you need to understand that the laws are very, very different for you if you are injured or hurt while visiting any commercial establishment owned and operated by a recognized American Indian Tribe on reservation land. 5. Seminole Coconut Creek Casino. Legally, the casinos owned and operated by the Seminole Indian Tribe on Seminole land are not in the State of Florida. No, they are not on Florida land and therefore, Florida state law does not apply to them. The Seminole Tribe has posted its “exclusive procedure for the handling of claims” on its website. Click on the image below to read this procedure’s full text. Injury claims for harm (even wrongful death) on Indian tribal property are considered as a claim being filed within a separate legal jurisdiction. Drive or walk across that property line, no matter how fun and fancy it may be, and you’ve exited the State of Florida. You’re subject to the laws of the Seminole Tribe now. So what happens if you are seriously injured, you suffer damage to property, or a loved one dies a wrongful death while you’re there? Seminole law applies, not Florida law. 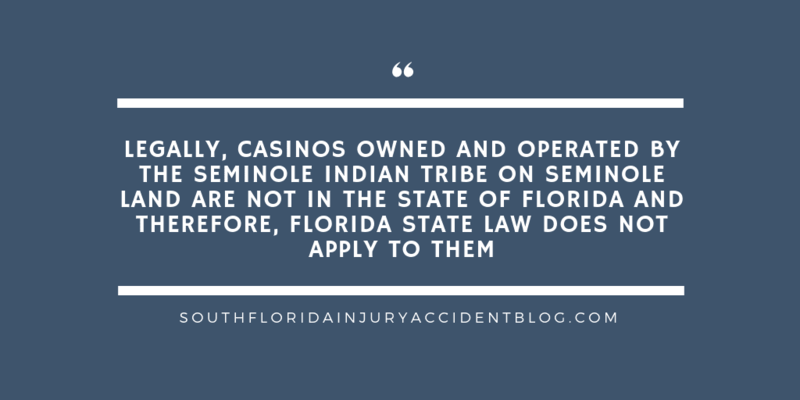 Bottom line: The Seminole Tribe requires you notify them of your injury to your body or to your property WITHIN SIX (6) MONTHS of when it happened, or you are forever barred from being compensated for your harm. You have 4 years to file this lawsuit. However, whether or not the Seminole sovereign immunity applies here depends on WHERE the injuries occurred. [covered] injuries to persons or property that occurred “in an area of the Facility where Covered Games are played.” This means only the actual gaming floor area where slot machines are offered or areas of the facility where banked card games and/or high-stakes poker games are played (if any). It does not include other areas of the Facility, such as walkways,restrooms, restaurants, hotel facilities and areas where only non-Covered Games are played. So, slip and fall or get assaulted in the hotel, at the restaurant, or in the casino restroom? Sovereign immunity still applies and per their Warning, you CANNOT sue for those damages. A good piece of advice if you have been hurt at a tribal casino, is to at least speak with an experienced personal injury lawyer before you file a claim to learn about some of the issues that can arise with these claims, including the type of evidence needed to prove a claim and the type and amount of damages you can recover. Most personal injury lawyers, like Alan Sackrin, will offer a free initial consultation (over the phone or in person) to answer your questions. Duty to Protect Yourself at a Hotel, Bar, Theme Park, Concert — Who Has The Responsibility to Protect Customers Against Injuries?